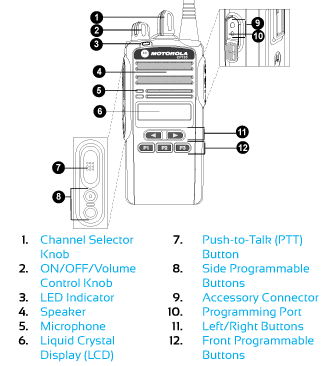 The Motorola CP185 radio comes with 16 channels, is capable of basic audio scrambling for added security and includes a display that will show what channel name is selected. $285.00 To see product price, add this item to your cart. What's this? 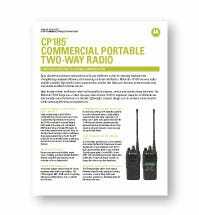 The Motorola CP185 two-way radio is a cost-effective radio that is ideal for education, retail, catering, and other professionals who need to keep in touch with their entire team. This convenient radio is available in both VHF and UHF bands, depending on your needs. The CP185 two-way radio is lightweight and has a compact, ergonomic design allowing ease of use and comfort. The radio can also be programmed for VOX activation. It has five programmable buttons allowing 10 different features to be set, and also supports multi-channel capability which allows communication among groups of employees on different channels instead of tying up main communications. With many other key features, the CP185 is the solution that you've been looking for. This 16-channel radio is able to handle communication for most organizations due to its Multi-Channel capability, allowing Employees to communicate with each other without disrupting the main communication channel. The CP185 can help make your organization more productive, help your team communicate more clearly, and assist you in raising the bar! This radio also offers adjustable power options, with VHF: 5W & UHF:4W, to help you extend battery life. Keeping you fully connected throughout your entire work shift. Audio performance features on two-way radios are important to pay attention to. Sometimes you may not be in an environment or situation where you can afford to "not hear" the last communication. This is why Motorola took the time to design the CP185 with above average audio, such as X-pand technology, to provide clear, crisp, and loud transmissions to your ears so you don't have to second guess. If your hands are busy when you receive a call, just turn on VOX for hands-free communication. The sound performance and audio in the CP185 was engineered well above average. The CP185 is great for organizations that currently use repeaters or are considering them for the future. They were designed for use with both repeater systems, to provide increased range & coverage, and for simple radio-to-radio communications. Keeping your radio fleet organized is essential to acheiving peak efficiency and productivity. 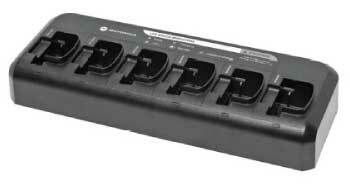 With the Motorola PMLN6597A Multi-Unit Charger, you can build your two-way radio charging station to keep your communication equipment organized, powered up and accounted for. The ultimate solution for high noise environments, with superior clarity, kevlar coiled cables, a flexible goose neck boom mic and heavy duty engineering, the M1-PDM-1-NC is the perfect choice in a high noise environment where a heavy duty headset is needed for the Motorola CP Series Radios.